Shares in Northern Rock have recovered some ground after the government promised to protect savers' deposits. Desperate to restore faith in British banks, Chancellor Alistair Darling pledged the Bank of England would guarantee all existing deposits. 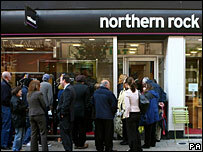 The move made the queues outside most Northern Rock branches disappear, while the bank's shares rose 8%. Northern Rock said that eight out of 10 people calling the bank inquired about returning money to their account. The bank had placed adverts in Tuesday's newspapers, promising "business as usual". The rise in Northern Rock's share price came after the bank had seen more than half of its value wiped out since Friday morning. Shares in other banks also recovered on Tuesday. Alliance & Leicester, which saw its shares fall by a third on Monday, gained more than 32% on the day. The Bank of England also announced that it would inject £4.4bn into financial markets, offering cheap credit through a so-called emergency tender at a rate of 5.75%, in an effort to shore up crumbling confidence in the UK banking system. In a sign that the run on Northern Rock was easing, the bank said its call centres were getting just 9% of the calls they had on Monday. The bank said it had received 3,472 calls by 1030 BST compared with 36,894 by the same time a day earlier, with eight of 10 calls made to reinvest money in the bank or cancel withdrawals. The Newcastle-based lender also reassured that its internet banking services had been virtually restored after running slowly over the weekend as a huge number of anxious online customers tried to log on. Mr Darling suggested that the government would underwrite the savings of any other bank that came to the Bank of England for help to promote "a stable banking system" in an interview with the BBC on Tuesday. But even as the groundswell of panic eased, there were growing question marks over the government's handling of the situation and how long they had known about Northern Rock's troubles before they took action. Former Conservative Chancellor Ken Clarke told the BBC: "I did not expect to see the government ever having to reassure worried savers with money guaranteed by the tax payer. "The response should have been clearer and quicker. It shouldn't require queues of pensioners down the High Street before the chancellor says something." 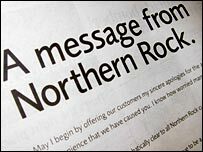 Northern Rock took out a full-page newspaper advert in most of the major newspapers on Tuesday, emphasising that the company was "well-managed" and would not let its customers down. The advert contained a statement signed by the bank's chief executive Adam Applegarth designed to reassure savers. "The simple fact is that the chancellor has made it clear that all existing deposits in Northern Rock are fully backed by the Bank of England and are totally secure during the current instability in the financial markets," he said. "These have been troubled times but Northern Rock will prevail." The move came after three days of long queues at branches up and down the country as customers withdrew more than £2bn of their money - about 8% of Northern Rock's total deposits. There were still queues of about 70 people at a Northern Rock branch in Golders Green and about 50 in Kingston-upon-Thames on Tuesday morning, with some anxious savers still not placated by the government's reassurances that their savings were totally secure. But in its home town of Newcastle, the streets around the bank were quiet. In the north east, there has been a general sense of support for the lender, which employes about 4,500 people locally and has given donations worth about £175m to community organisations through its charitable foundation. The former manager of Newcastle United Sir Bobby Robson said he would open an account at Northern Rock. The Financial Services Compensation Scheme that covers banks has come under fire as a result of the crisis. It protects 100% of the first £2,000 in any bank account and 90% of the next £33,000 - giving a maximum payout of £31,700 if a bank did go bust. FSA chief executive Hector Sants told the BBC's Radio 4 Today programme that he would be looking to improve the savers' guarantee scheme, which he said "has limitations", particularly with regard to larger deposits. In a separate interview with the BBC, FSA chairman Callum McCarthy criticised Northern Rock's heavy reliance on short-term loans to fund its key mortgage business as "extreme". He said the FSA required banks to "hold capital to deal with issues such as these". The comments come a day after he said the move by the chancellor was not designed to "save the Northern Rock per se". BBC Business Editor Robert Peston added: "If the run on Northern Rock isn't stemmed by the government's decision to guarantee that no depositor will lose money, well then nothing will stem it." Northern Rock applied to the Bank of England for emergency funding last week. This hit Northern Rock more than other banks, as it used the financial markets to fund its mortgage business to a far greater extent than other banks.